Frightening is the first word that comes to mind for most people when asked to describe their first panic attack. Unless you have the good fortune to be medically trained, panic attack symptoms will probably leave you convinced that you are on the verge of some kind of break down or in the throes of your first heart attack. The signs and symptoms of a panic attack can vary dramatically from one person to another but you can pick from a long list that include a racing heart beat, palpitations or heart flutters, dizziness or feeling faint, shaking or trembling, hot flushes, cold sweats, blurred vision, tingling or pins and needles in your extremities as well as nausea. 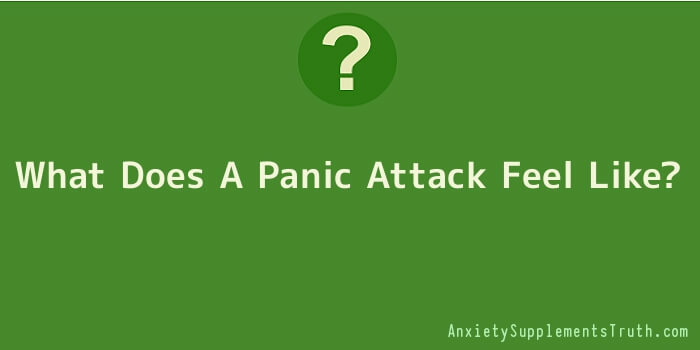 Panic attacks are often referred to as anxiety attacks. Many people may be experiencing panic attacks and are not even aware of it. Because panic attacks can vary widely from individual to individual, they are often difficult to diagnose. Knowing what a panic attack feels like can go a long way towards learning what to do and how to deal with them. Panic attacks may suddenly come on for no reason, with no warning and may last a couple of minutes or an hour or more. One of the major symptoms is that the individual will suddenly have an overwhelming feeling or sense of fear. This is caused by the adrenalin in our body, which our system makes as a response to fear or danger, whether it’s imagined or really does exist. When our body becomes flooded with a more than normal amount of adrenaline, we experience the symptoms of a panic attack. These symptoms may include fast heart rate, fear of danger, feeling of dread, upset stomach, trembling, fast breathing, fainting, dizziness and occasional diarrhoea or frequent urination. Some also experience a sense of being “distant” from people and surroundings. When an individual is suffering a panic attack, they may not be aware of what’s happening and may think they are suffering from a serious health condition such as a heart attack because so many of the symptoms are similar. But often, simply knowing what a panic attack feels like and preparing yourself in advance is very effective in bring temporary relief to the patient. Unfortunately, many individuals try to avoid talking about their panic attacks and actually ignore them rather than seeking help for them. They often do this because they are embarrassed and feel it’s all in their head. Fear of having a panic attack has often been said to bring one on suddenly because the body is in a steady dread of a panic attack starting without warning. Although, they usually do come on without warning, some individuals say they often get certain warning symptoms that let them know they have a panic attack approaching. Other symptoms that may often hit an individual having a panic attack are feeling that death may happen at any time or that they are losing control. It’s very unfortunate that so many individuals suffering from panic attack don’t seek treatment. In many cases, panic attacks can be helped with therapy, counselling or medication. Although panic attacks may affect a wide variety of people for no apparent reason, in some situations they’re a sigh of a health problem or a result of stress, illness or past injury. These are only a few of the reasons why sufferers of panic attacks should seek help for this painful and stressful disorder.